This Fall, I keep getting asked the same two questions – how can I boost my immune system, and how can I fight this lingering cough? It seems like everyone is sneezing and coughing. So if I had to recommend one small change to your diet to improve your chances of avoiding winter viruses, it would be to eat more vegetables. I know, it is not mind-blowingly new and unique advice. But it really will help keep you and your immune system functioning at optimum levels. There is no better way to get essential vitamins, minerals, antioxidants, and anti-inflammatory compounds into your body than by eating a wide variety of colorful fruits and vegetables. 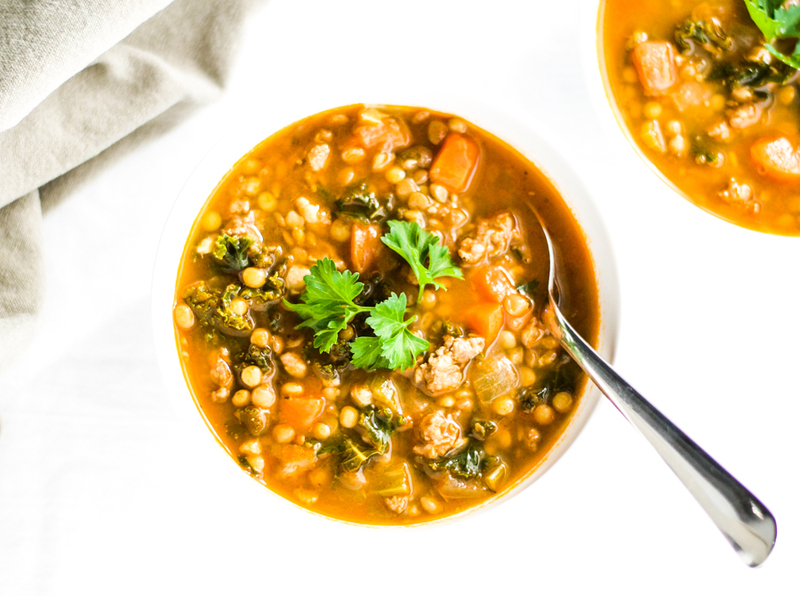 And this deliciously comforting sausage, kale, and lentil soup is a great way to help you do that. I know people have been singing the praises of kale for years now, but it is with good reason. Kale is one of the most nutrient dense foods around. In just 1 cup of raw kale (~65 grams), you get 3 grams of protein, 2 grams of fiber, more than your recommended daily allowance of vitamins A, K, and C, as well as some powerful antioxidants. Those antioxidants have been shown to have anti-inflammatory, anti-viral, anti-depressant, and anti-cancer properties. And while I’m not saying you should force yourself to eat buckets of kale if you really don’t like it (there are plenty of other healthy vegetables to chose from), it is an excellent choice. This sausage, kale, and lentil soup is a truly delicious way to add more kale to your diet. 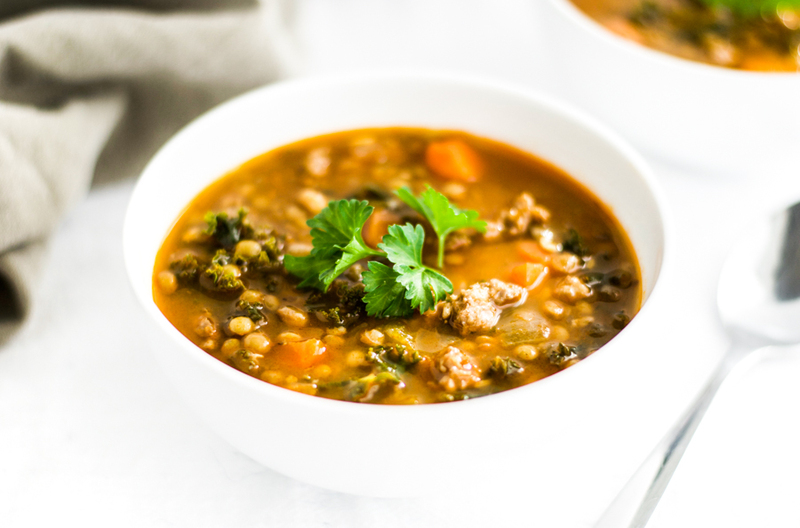 This sausage, kale, and lentil soup is a deliciously comforting way to increase your intake of healthy, antioxidant-rich kale. Heat the olive oil in a Dutch oven or large pot over a medium heat. When hot, add the sausage meat, breaking it up with a spoon until it starts to brown, about 5 minutes. Add the onion, celery, carrots, and garlic. Cook until softened, around 5 minutes. Add the lentils, fennel seeds, and tomato puree and cook for 2 minutes. Add the broth, water, and oregano, bring to a simmer, and cook until the lentils are tender, about 40 minutes. Once the lentils are cooked, add the kale and cook for a few minutes until it has softened. Remove from the heat, add salt and pepper* as necessary, and serve. *Don't add salt until after the lentils are cooked otherwise they can get a bit tough. LOVE sausages and LOVE stew… I’m really looking forward to making this recipe! A great idea to use fennel seeds too. I happen to like my kale softened slightly so this ticks a lot of boxes for me! And did anyone mention eating more veg…? !… Yes, yes, yes! 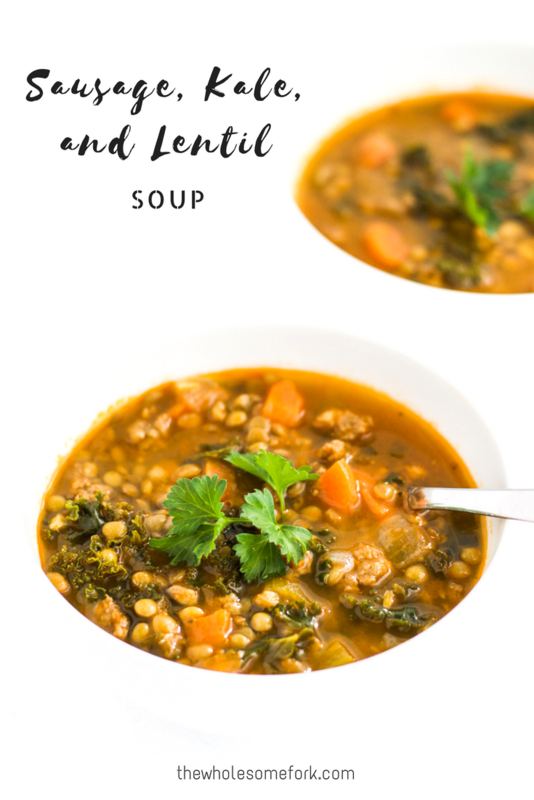 Sausage, Kale, And Lentil Soup are among my favorite! That looks like a bowlful of pure comfort! I can easily see myself making this with meatless seitan sausages, too. Did you know you can change the course of your health just by eating the right food? I am here to show you how you can eat simple healthy food without stress, guilt, or shame.